Re-designed bearing block for perfect main shaft alignment. Provides a more rigid design in the 3 axis with free rotation thanks to a special stainless steel, ABEC-3 precision bearing and thrust bearing. This means a more rigid frame for precise and responsive 3D maneuvers , longer bearing life, reduced noise, and better efficiency for very hard and intense 3D flying. Pre-Assembled with SST ABEC-3 precision bearings and thrust bearing. 2 x Main Shaft Bearing Block with pre-assembled bearing and thrust bearing. If you desire increase the torsion resistance and the rigidity of your T Rex 700 N frame, Lynx advise to install X Carbon Fiber Plate LX0102. 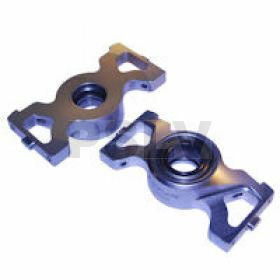 The plate is designed especially to be installed in Lynx Bearing Block increasing dramatically the frame stiffener and resistance.